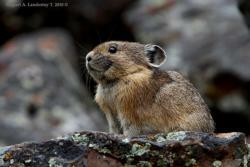 Help scientists track where pikas persist and where they may be disappearing. Pikas are chirpy relatives of rabbits that live on mountaintops throughout the North American West. www.inaturalist.org/projects/american-pika-atlas and click 'add observations'. Log in to iNaturalist.org the engine behind the American Pika Atlas with your Facebook, Twitter, Google, or Yahoo account. Upload your pika photo from your hard-disk or link to your photo that's already on Facebook, Flickr, or Picasa. Add a date, geographic coordinates, identify your observation as American pika, and click 'Save observation'.